This poster of the three brothers just shows how famous they were not only in Europe but also America. 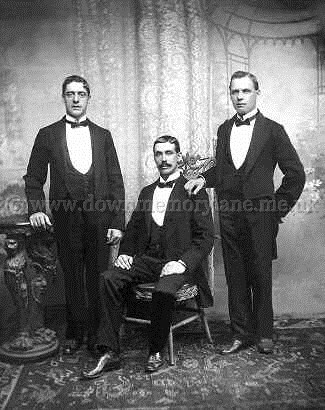 This protrait photograph is of the 'Three Wood Bros.' at the height of their success and who came from Randalstown. 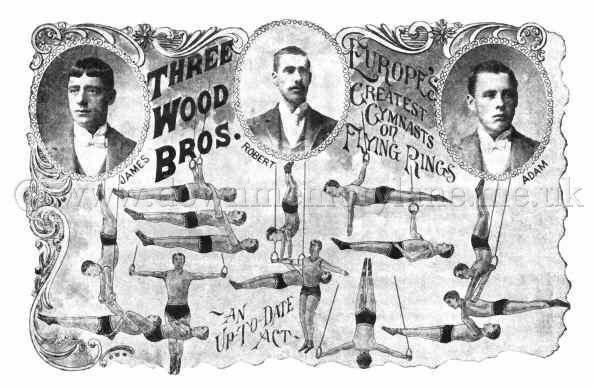 They were very famous throughout Europe and America and were billed as " Europe's Greatest Gymnasts on Flying Rings "
James, Robert and Adam always had an up to date act by continually changing their routines. 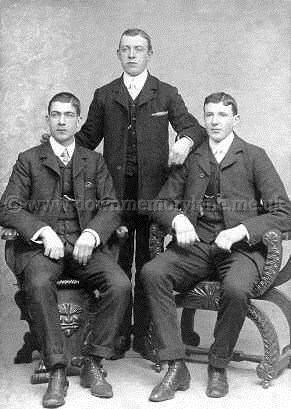 This portrait photograph is of the 'Three Wood Bros.' at the start of their career who came from Randalstown. 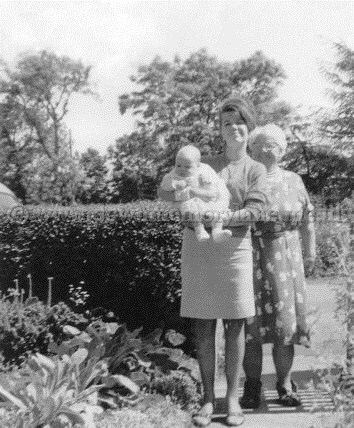 They were very famous throughout Europe and America and were billed as " Europe's Greatest Gymnasts on Flying Rings "
Standing proudly in her garden at Craigmore Randalstown which shows she has green fingers is on the right Anne Dowie. Next to her is her Granddaughter Ann Hamill and in her arms Great Granddaughter Barbara Hamill. 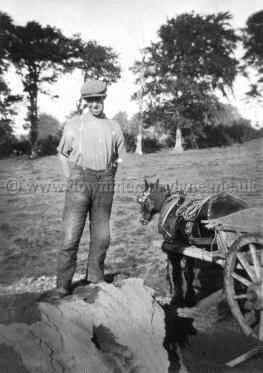 which he has just delivered in his horse and cart to this field. 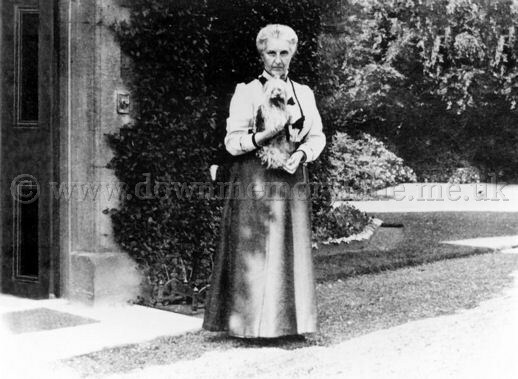 Here we have the Hon Anne O'Neill outside Tullymore Lodge in Broughshane where she often resided with her beloved dog in her arms. 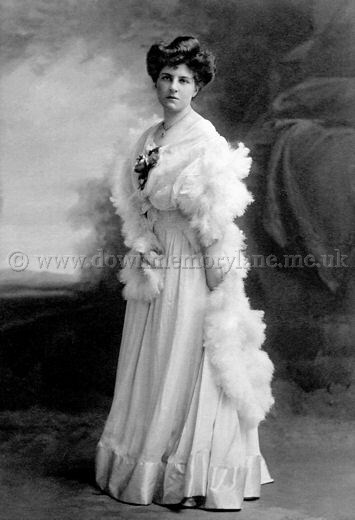 Having her photograph taken at a studio in South Kensington is the Hon Mrs Leith Hay. The Hon Mrs Leith Hay before her marriage was Hennrietta ONeill from Shane's Castle. 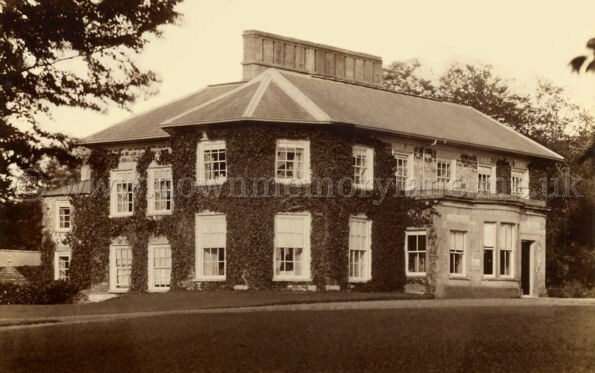 This is Tullymore Lodge at Broughshane and was sometimes the residence of the Hon Anne O'Neill. or writing a letter and a candle provided for when it got dark. Some one also knitted as can be seen by the balls of wool in the basket in front of the chair. 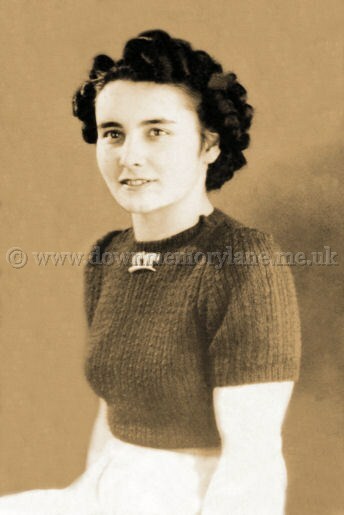 Now this lovely girl is Tillie McCaughey then aged 20 back on the 21st November 1942. 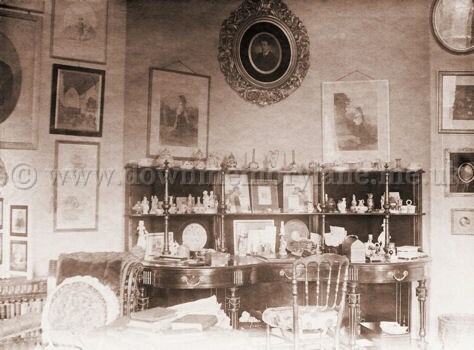 This is the other side of the Drawing Room at Tullymore Lodge in the 1900's. 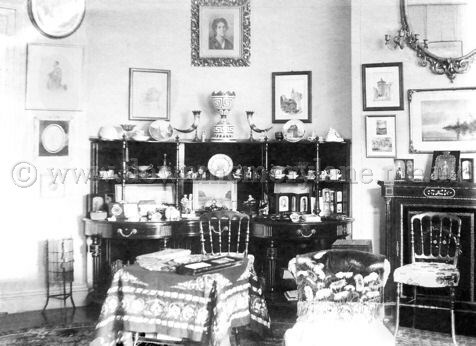 The photograph must have been taken in the summer as the fireplace has not been set. 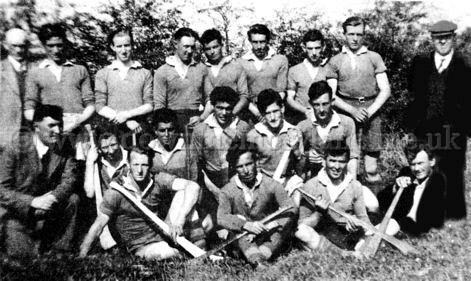 Here we are at Ballycran with the Tir-na-nOg hurling team of 1947. At the back from the left are P Doran, A McCollum, C Close, J McNally, D McKeown, S Letters, S McVeigh, S O'Kane and A Martin. 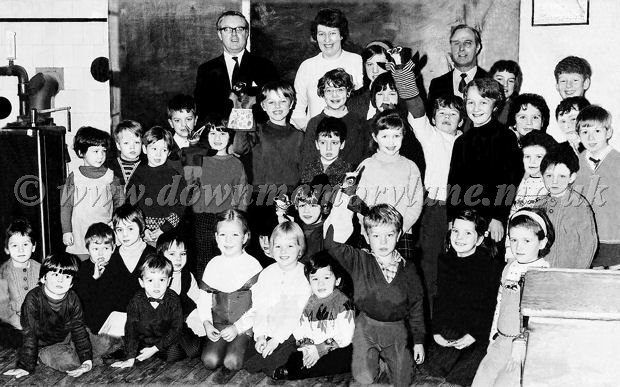 In the middle are Hugo McCormack, Harry McCormack, S Martin, H McCollum and A McVeigh. At the front are P O'kane, R McGuigan, J Heffron, H Shannon and J O'Boyle. This is a very rare photograph of the Letters dance group who because they just love dancing are not normally found seated. 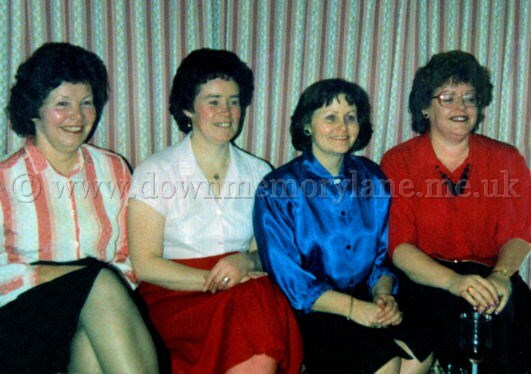 Here they seem to be enjoying watching the other dancers, well from the left we Maureen, Dorothy, Veronica and Mona. 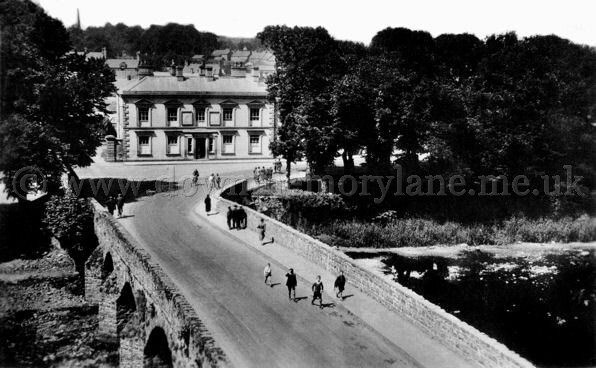 Looking down from the railway viaduct in the 1930's the photographer has been spotted by the four eagled-eyed boys on the town bridge in Randalstown. The photograph must have been taken either during a holiday period or a weekend for the men and ladies are dressed in their ordinary day clothes. 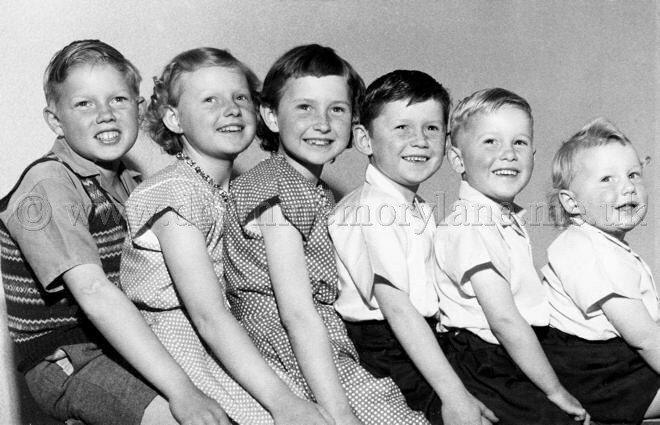 This lovely photograph was taken in the 50's and is of the Thompson children, some where born here in Randalstown and the rest in New Zealand! From the left are Roy, Joan, Anne, James, Geoffrey and finally with his lovely curls is Eric. standing and she is holding up with pride her "Tuffty", her name then was Nicolette Watson but is now Jamison.